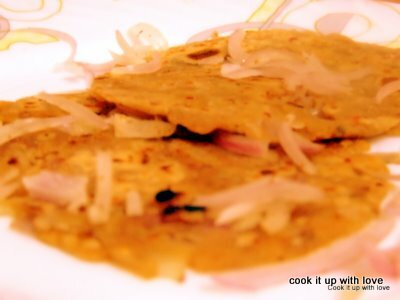 Here is one more paratha, dedicated to onion lovers. Make a soft dough out of wheat flour,salt, & oil, and set aside for 15-20 minutes. Now steam the thinly sliced onions, and transfer to a bowl, after squeezing out excess water from it. Mix amchur powder, salt, red chilly powder, coriander leaves & garam masala with the steamed onions. Now make small balls out of the dough. Roll out a dough, place one spoon onion masala in it, seal from all sides, and again gently roll out to make parathas. Now heat a pan, apply oil or ghee, and cook the paratha in it till both sides become brown and crisp. Goes well with curd, dal or lime pickle. This entry was posted in Paratha Recipes, Quick Bites . Bookmark the permalink.